GPS device manufacturer Garmin teamed up with electronic vendor Asustek Computer to create their first Windows Mobile smartphone which launched earlier this week in Taiwan. 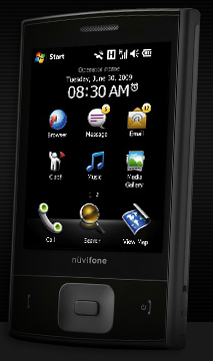 The phone, the Nuvifone M20, features a 2.8-inch touchscreen, a 3.0-megapixel camera, 4GB of flash memory, QWERTY keyboard, a full web browser, Wi-Fi, Bluetooth, and a Qualcomm 7200A 528MH CPU. The phone’s camera also automatically geotags photos with date, time, and location data. Of course, the phone features Garmin software for turn-by-turn directions in addition to other pre-installed applications like Microsoft Office and a location-based social networking platform called Ciao!TM that integrates various social networks into one interface. What’s really cool are all the included location-based applications that deliver info like real-time traffic updates, gas prices, flight times, weather, White Pages and local search.